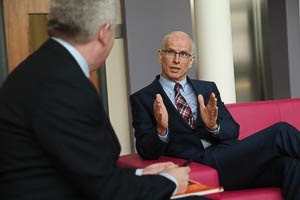 SONI General Manager Robin McCormick outlines the changing nature of the power system and explains how his organisation is facing up to the challenge to match supply with demand on behalf of electricity consumers. Robin McCormick heads up System Operator Northern Ireland (SONI) which manages the region’s electricity transmission system and wholesale electricity market. The organisation has been on a journey as European legislation has ‘unbundled’ the electricity sector i.e. separating out the supply, generation, distribution and transmission parts of the business. The most recent impact, he explains, has been the transfer of grid planning from NIE to SONI in May of this year. The other impact of the European legislation is the integration of electricity markets which will create more efficient links between regional and neighbouring electricity markets. “When these factors combine, the industry is in quite a state of change and is a difficult place for investors, a challenging place for regulators and for us,” he surmises. “We regard ourselves as pivotal in holding the jigsaw of industry players together. 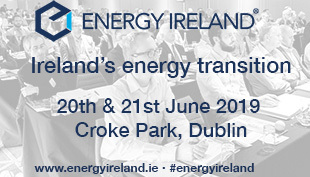 It is a fascinating time, but making progress over the next two years is going to be important to get us through a number of challenges.” At the moment, both the British and Irish markets are introducing new arrangements and managing the increasing proportion of renewables on the system – both engineering and technical challenges. Before discussing changes to the electricity market on the island, he reflects that the industry originally agreed there was a need for the establishment of a Single Electricity Market Operator (SEMO). The operator is a joint venture between EirGrid and SONI. This phase of change essentially involves maximising the benefits of interconnectors to customers. Northern Ireland is connected to Scotland via the Moyle Interconnector (operational since 2002) and Ireland to Wales via the East West Interconnector (operational since 2012). Maximising the efficiency of the trading via interconnectors across Europe has been one of the key drivers for the market integration. A new market is needed as the current market is becoming a difficult operating environment for many market participants as more and more renewable energy comes onto the system. This causes a downward pressure on the market price and means that conventional generators – whose plant will still be needed but used less and less in the coming years – are finding it difficult to operate. These generators are therefore looking very closely at the new market to understand how it will impact on them. The wind industry is looking at the support mechanisms in Britain, Northern Ireland and Ireland, and seeking to build sustainable business cases for future investments. McCormick notes that there is “a level of uncertainty at the moment” in all three jurisdictions. “We are working with market players and regulators to get the details of the new market agreed,” he explains. EirGrid’s role is to implement the new market and to procure the new central market systems that will interface with all market participants. The need for a second North/South interconnector “has been recognised for some time” but the project “has taken much longer than anticipated to deliver.” The project was first launched in 2007 but the planning application was withdrawn in 2010 to provide more detailed information for communities living along the proposed route. A planning application in Ireland will be lodged with An Bord Pleanála and this will allow the process here to restart with the Planning Appeals Commission. McCormick hopes the approval process will be completed in 2015. EirGrid has recently announced a range of initiatives to improve the way in which it consults on major infrastructure projects. SONI will develop and implement this learning in Northern Ireland for future projects. The rationale for the second interconnector is very clear. In its absence, customers across the island are paying an additional €20 million or more per year for electricity. In terms of security of supply, while the island has enough capacity to meet its overall electricity demand, it needs a second interconnector to ensure that this benefits all parts of the island. McCormick recaps that the future system will involve more renewable electricity, together with the pressure of ensuring that any new infrastructure is “absolutely required” and will deliver benefits for customers. This has “pushed us to be better at managing a power system with a lot of intermittent wind generation.” Due to its small size and a relatively small electricity market, the market here has reached pinch points on the system earlier than other parts of Europe. Over the coming years a programme of work has been established called Delivering a Secure Sustainable Electricity System (DS3).The programme supports the development of advanced control tools and system services. This will enable SONI to operate the system safely and reliably and to reach the target of 40 per cent by 2020. NIE and ESB are using the North Atlantic Green Zone to explore different approaches to run the distribution system, with SONI and EirGrid focusing on the transmission system. This is one of only two smart grid initiatives in the EU’s Projects of Common Interest (PCI) programme. PCI projects receive funding under the Connecting Europe Facility (CEF), which has a €5.85 billion budget for supporting trans-European energy infrastructure until 2020. The Smart Grid Innovation Hub (www.smartgridinnovate.com) demonstrates a commitment to encouraging industry to develop new technologies. The hub is a collaborative initiative between EirGrid, SONI and the National Digital Research Centre in Dublin to promote the development of innovative smart grid solutions. It is a free support service with a focus on entrepreneurial initiatives by companies, academics and entrepreneurs in Ireland and Northern Ireland. “Small technology companies often find it difficult to break into the industry despite having some great ideas,” McCormick notes. The aim is to deploy emerging technologies which can both solve some of the power system’s problems and become commercial propositions. In addition, its demonstration project initiative allows industry scale technologies to be deployed in a test environment e.g. Glen Dimplex and ESB are installing a fault-limiting superconductor device on the network. Robin started in NIE when it was a public sector organisation with a public sector ethos and experienced the transformation of the industry with privatisation in the 1990s. 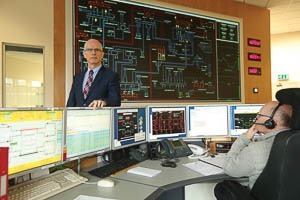 He came back into the transmission system operations role on 1 April 2002, the same day as the Moyle interconnector went into commercial operation and oversaw the transformation of generation with the introduction of combined cycle gas turbines at Coolkeeragh and Ballylumford. Robin was heavily involved in the Single Electricity Market – “a transformational project for the industry” – from its inception. 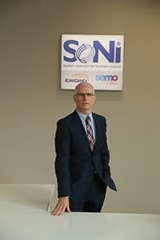 SONI was subsequently acquired by EirGrid in order to focus on the consumer and optimising the running of the grid across the island. His main interest outside work is running and he will soon complete his tenth Great North Run in Newcastle upon Tyne – the world’s largest half-marathon.